We did a lot of work today. Sometime around three thirty we went in to have some water and noticed the time and had a moment of dissonance, thinking that it must have been much later in the day. Guess that's what happens when you get an early start on the day. 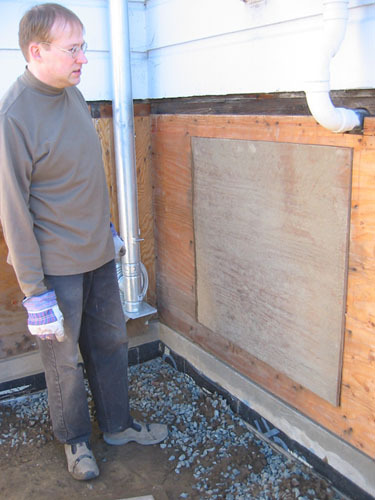 Noel started out by putting the hatch doorway on the basement. We are now very very close to having a locking door, so we can put tools down there. I am looking forward to putting tools down there more than anything. 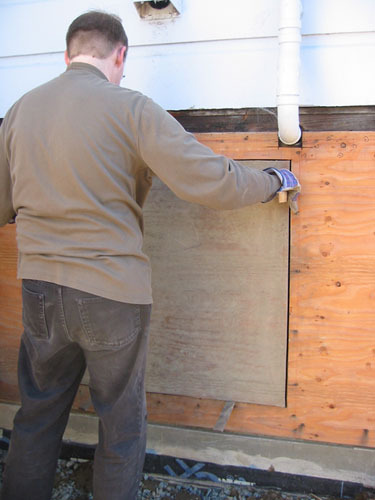 By a lucky chance, it turned out that the one piece of plywood we had saved for the door was the one originally cut out to make the opening, so it was a perfect fit. We stood and stared at it for a couple of minutes, surprised. Noel cut some more off to make the fit looser (wood expands and contracts, and we didn't need a perfect fit) Then he used wedges and nails to hold it in place in the opening. Here it is, actually serving as a door. It's been more than a year since we had a basement door. 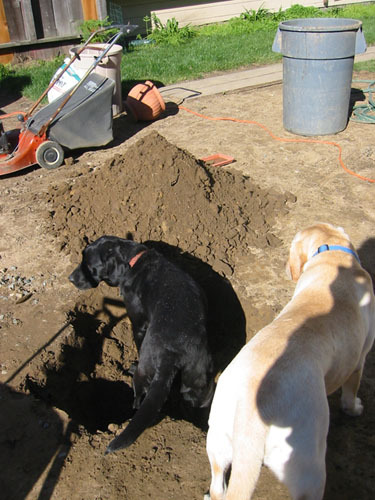 In the mean time, I began digging holes for trees. 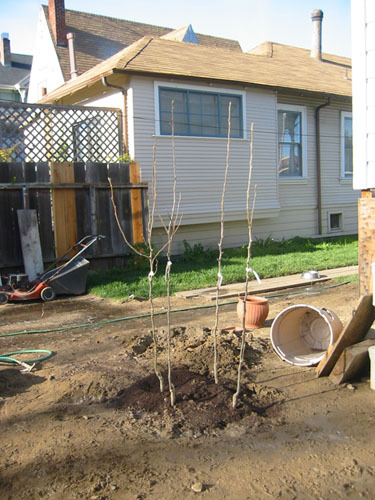 The first trees I planted were the asian pears, which go right in the notch at the back of the house, outside the basement hatch. The dogs, of course, had to check everything out. 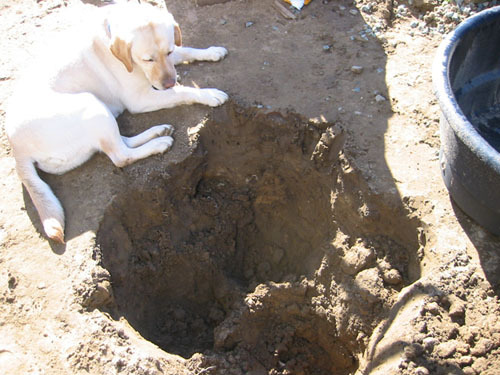 When I'd dug the hole out and was measuring to make sure the trees fit, Goldie came along and lay down next to it as if it were a resort swimming pool. 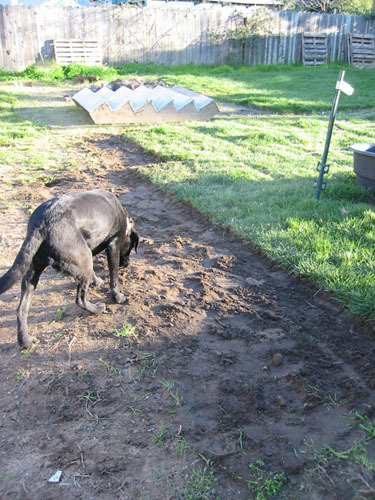 I had laid the bare-root trees across two trash cans, and Rosie was very interested. They looked like large sticks to her. I guess they are. Keen eyes will notice that there were three trees in the previous picture, and there are four here. That's because I managed to forget that I'd ordered four asian pears (the fourth was an impulse purchase), and I had to go back and dig another hole and add the fourth one after I was done with the first three. But all's well, and even though I keep noticing that they are not perfectly symmetrical in the hole, they're planted now and staying that way. 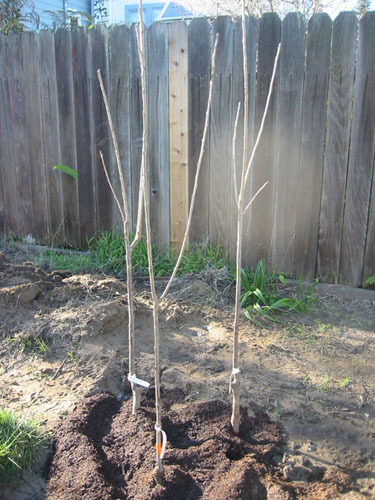 Also in this order of trees (bought through Bay Laurel Nursery, in Atascadero; wonderful folks and a really fun nursery to roam around in) were the cherries and blueberries. Three sweet cherries and a sour. I don't know what I'm going to do with so many sweet cherries, but they aren't self-fruitful so I needed a pollinator. Here they are, all planted in the orchard. To plant the sweet cherries we needed to move the old front stairs, which have been propped up against the side fence since the grading was done. We're still planning to grade the soil a bit leveler, so I dug out around the cherries and planted them at the right elevation. After we had finished the trees, we spent some time ripping up sod and moving it by the side porch. We actually managed to fill in quite a bit. 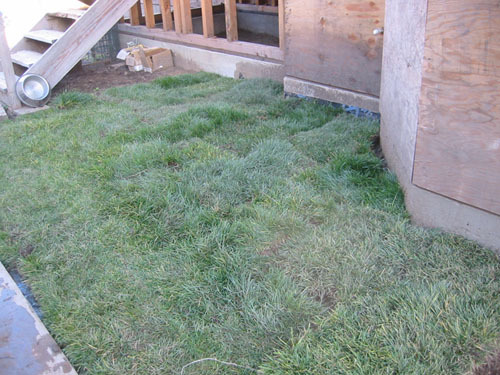 The sod came from the "holding area" we created when we first sodded the lawn in October. Eventually all the sod from that patch will move. In fact, I'm going to have some topsoil delivered next week to fill in the moat next to the house, to aid in that. While we were dirty, we did a bunch of site cleanup. Noel dug out a bunch of gravel and dirt from the front that was over the little diagonal bit of the driveway, and in the corner of the front lawn. 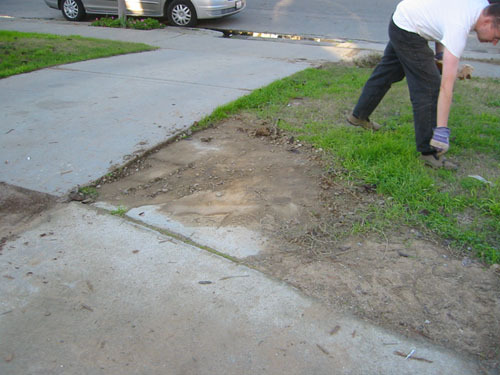 We removed the pile of concrete chunks from the front walk. And we spent some more time on the back pile. 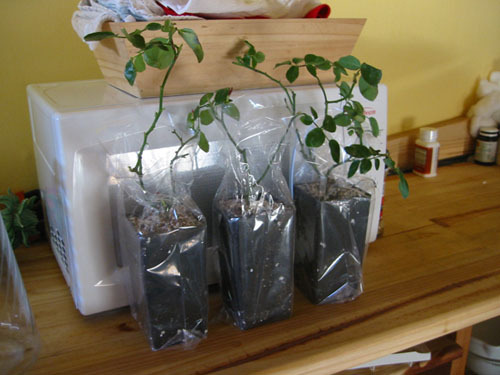 Tomorrow we're going to work on the back pile some more, and I'm going to pot these three roses: they are The Generous Gardener, but they're going to go right by the driveway and I need to figure out exactly where before we plant them. So they can go in pots for now. 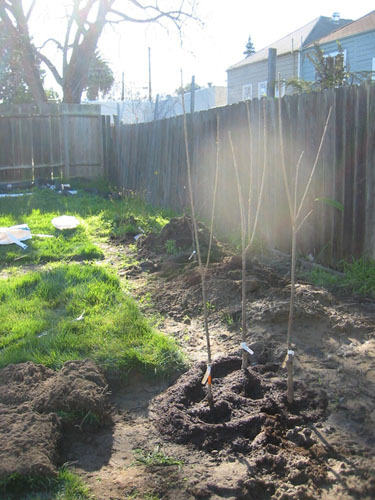 Yes; I am using a method called high-intensity planting, where trees are about 18" apart, planted "all in one hole." 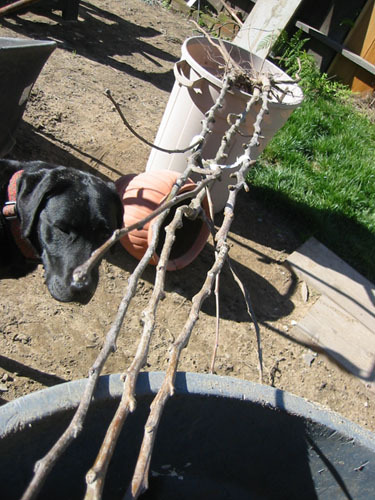 You use lots of summer pruning to control for size and shape (keeping them from choking each other, basically), and you end up with less fruit from each tree but more kinds of fruit. Please do not make up words or mutate real words to convey yourself. 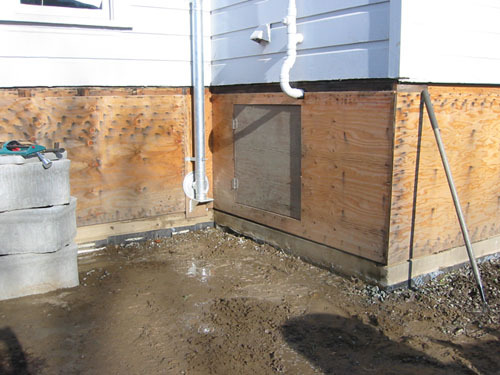 "We're still planning to grade the soil a bit leveler." To convey myself? Maybe you want to step away from that pot of black paint, "BD and Jack." Oh, and you might want to recheck your OED.